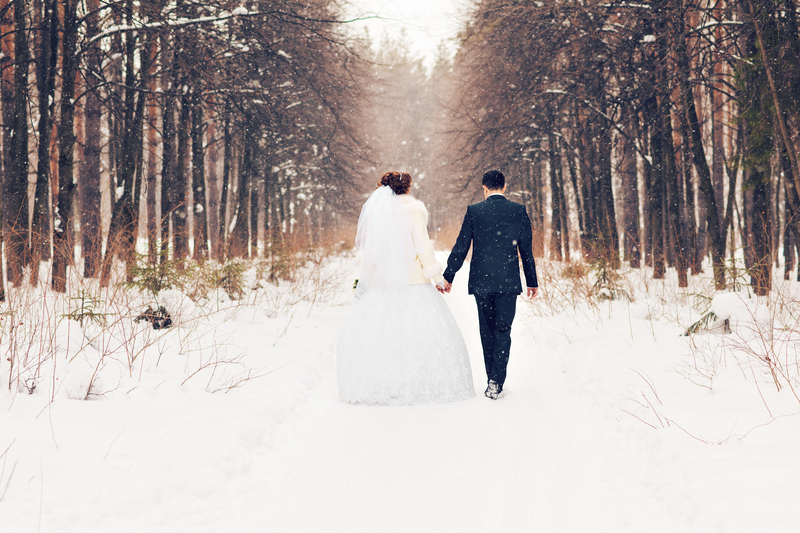 Because spring and summer are the most popular seasons for weddings, Feliciano reminds us that winter is typically off-peak season for wedding vendors. With less competition, the availability of a venue will be greater and you’ll have a better chance at negotiating a good rate. Off-peak rates can be a whopping 10 to 30 percent less than peak seasons. Welcome guests with spiked hot apple cider served in hollowed out apples garnished with anise stars and a nice stout beer (like Brooklyn Brewery’s Black Ops). Have a hot cocoa station with add-ins like marshmallows, crushed peppermints, red hots (cinnamon candies), cinnamon sticks, sea salt, hazelnut/caramel/vanilla flavored syrups or an elegant espresso/cappuccino station with amaretto-flavored whipped cream, rock candy sticks, chocolate shavings, ground cinnamon, ground nutmeg and assorted biscotti for dipping. Great winter appetizers: warm tomato-basil bisque shots with mini grilled cheese or a Southwestern black bean soup garnished with a mesquite grilled shrimp. Entrees: Butternut squash ravioli with sage butter and a roasted leg of lamb carving station. Dessert: Caramel and candied apples or a s’mores setup. Most venues and churches are already decked out for the holidays, which saves the couple money on decor. Though practically any color works in the winter, it’s the perfect time to be adventurous and experiment with rich, bold palettes like dark purple and fuchsia or gold and cranberry. Feliciano says she is also a fan of adding enchanting accents like crystals, glitter and metallic materials that seem so right this time of year. “There will be at least six weddings your friends and family are invited to this summer, but yours will be the one they are invited to this winter,” Feliciano said. The fact that your wedding will break up what many consider a bleak time of the year means they’ll actually be excited to go dress shopping, get all dolled up and party with you all night. Can we talk about winter bridal styles for a second, because they are fab. Feliciano reminds us that winter brides get to choose among lavish [faux] fur stoles, muffs, fashionable knit sweater wraps or luxurious velvet capes, hats and mittens, long satin gloves, lace bridal booties and jewelry that will make you look like the Queen of Arendelle. Summer humidity really doesn’t do you any favors when you’re trying to look your best on the most important day of your life. The frosty air will keep your cheeks perfectly rosy and your makeup won’t run for its life. And a bonus for the groom and his groomsmen (See? We didn’t forget about them), they won’t have to worry about sweating in their suits or tuxes. “Who wouldn’t love to arrive in a sleigh led by gorgeous huskies through the snow?” Feliciano said. Other fun winter entrance and exit ideas include throwing fake snow or white feathers instead of rice, walking down the aisle to a beautiful Christmas song and treating your guests to Valentine’s Day chocolate and “love note” favors.